18 in. x 24 in. no matting 22 in. x 28 in. double matted protected with clear glass with black frame, hanging hardware included. Framed Urban Meyer poster with Ohio Stadium. 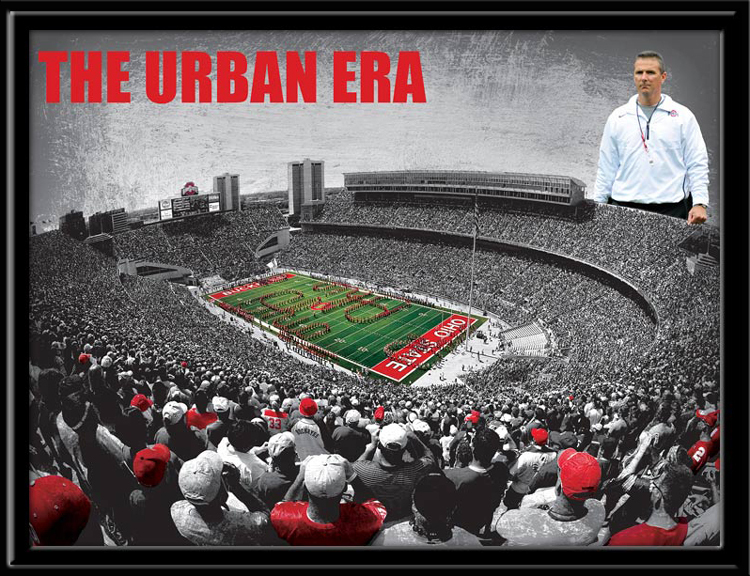 A New Era in Ohio State football begins Fall, 2012 when Coach Urban Meyer takes over the reins as the 24th head coach. A beautiful panoramic shot of Buckeye fans in Ohio Stadium with quad Script Ohio on the field. I am honored and humbled by the opportunity to return to Ohio State. This University and the State of Ohio have enormous meaning to me. My duty is to ensure that Ohio State's football program reflects and enhances the academic mission of the institution. I am part of it, I believe in it, and I will live it. ; Coach Meyer Available matted with a top mat of gray and bottom mat red, or reversed. Also available without matting . Prints are not available unframed. See More Ohio State Posters.